In recent weeks, the right-wing government in Argentina has been forced to hike its policy interest rate (which sets the floor for all borrowing rates) dramatically from an already high 27% in April up to 40% last week. 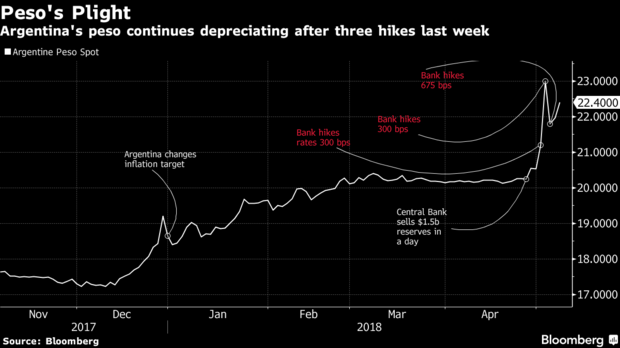 In January, the Argentine central bank had been experimenting with reducing its interest rate but that came to an end very quickly. Why? For three reasons. First, foreign investors (who are key to the success of the austerity and pro-business policies being adopted by the Macri government) were concerned that inflation was not under control and began to withdraw their capital. Even the government admitted that inflation was heading towards 15% this year. The Argentine peso started to slip against the dollar. Second, the dollar started to jump in the last month because of fears of an international trade war, which always leads to investors rushing to the ‘safe haven’ of the dollar and because the US Federal Reserve is pressing on with raising its policy rate, thus making investing in other countries’ currencies less attractive to speculators. And third, there has been a sharp rise in the crude oil price, driven by attempts to boost it from the OPEC cartel in the Middle East and growing political tensions between the US and Iran. That means extra costs of importing energy for many economies like Argentina, Turkey or South Africa. Those economies with large trade deficits, high inflation and apparently little control over their government spending, and above all, high levels of debt, are the most vulnerable to foreign investors taking their money away. And that means Argentina, Turkey, South Africa and others. The Argentine peso has now fallen to a record low (fuelling even more inflation) and its government bond prices have plummeted. Only last year the Macri government issued a 100-year bond, confident that enthusiasm for the ending of the left-reformist Kirchner administration after 12 years would lead to a flood of foreign demand. The value of the bond has now dropped to 83 cents to the dollar. With the government now offering over 6% interest on that bond, compared to just under 3% for the ‘safe’ US government bond, the government is hoping to stem the outflow of capital. The central bank in Buenos Aires has blown $5bn of foreign exchange reserves in a week and enacted three shock rate rises in an attempt to halt the slide in the value of the peso. But rising interest rates in the US threatens to put many emerging economies, both their corporate and government sectors into new difficulties. Many have borrowed dollars to cover their deficits, to invest or to speculate, and now the cost of that debt is going to rise. Turkey is now seriously in trouble. The Turkish lira sank, in spite of the central bank intervention. Dollar-denominated government bond yields jumped to new post-crisis highs and the stock market extended its decline this year to 22 per cent — the worst performance of any bourse in the world outside of Venezuela. If the central bank hikes rates, as Argentina has done, it risks inflict severe damage on the local economy. 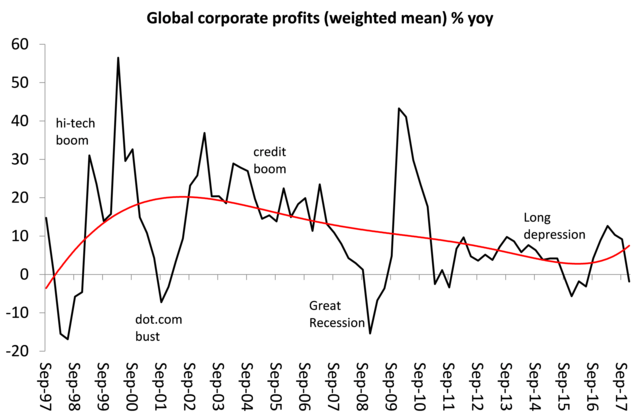 In previous posts, I have raised the risk that the hiking of interest rates by the Fed could provoke a debt crisis, particularly in the so-called emerging economies, because debt levels have reached record high levels in those economies. Also global debt is at a record high because governments and corporations have borrowed heavily at cheap rates in order to stabilise the banking system and boost stock markets and spending. 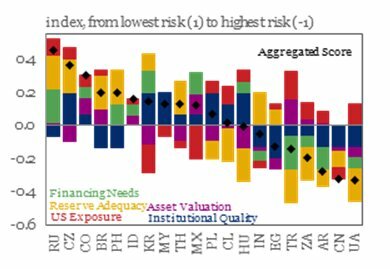 The Washington-based Institute for International Finance (IIF) argues that, in addition to Argentina and Turkey, Ukraine and South Africa are relatively vulnerable to a sharp shift in ‘risk appetite’ by foreign investors – see graph below. The IIF now reckons that global debt rose another $21trn in 2017 to take the total to $237trn. Sure much of this extra debt has been incurred by China, but that economy is much more able to manage that debt. Most of it is in local currency not dollars and China has huge foreign currency reserves in dollars ($3trn) that provide a buffer for any debt collapses. But other ‘emerging’ economies are not so well placed. Dollar and euro debt now tops $8trn in these countries or 15% on average of all debt. Argentina’s debt is over 60% owned by foreigners, while Turkey has seen one of the biggest rises in FX debt since the end of the Great Recession in 2009. As interest rates rise on this debt, servicing it has become more difficult. 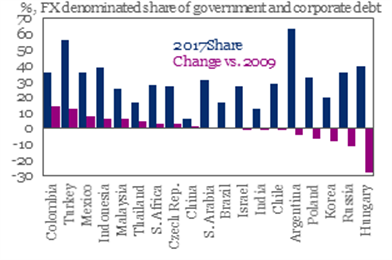 According to the IIF, ‘stressed’ firms now account for more than 20% of corporate assets in Brazil, India and Turkey and those companies where profits are greater than interest costs are shrinking fast. “Even with low global rates, many non-financial corporates are running into trouble with debt service,” the IIF added. In Argentina, interest rates for smaller companies have moved above 15%. “Companies have burned through their working capital since then as they can’t get rational financing,” he said. “Big corporates with access to international financing are in a better position, but medium and small companies are in trouble.”, said one analyst. The crunch will come when corporate profits in many economies begin to fall as debt servicing costs rise. My latest estimate of global corporate profits (based on a weighted average of profits in the US, Germany, the UK, Japan and China, showed a fall in the last quarter of 2017 for the first since mid-2016. It remains to be seen how things went in the first quarter of 2018.